It's that time of year again time as tricky winter driving conditions prevail. Our Motoring Editor, Donal Byrne, tells you how to avoid trouble on the road. We also have very useful video advice. The old advice is the best advice: be prepared and don't make a trip in really bad conditions if you don't have to. Ask yourself twice or three times if the journey merits the risk you are taking ? Many drivers have a sense of invincibility behind the wheel but when things go wrong in ice or snow conditions that go wrong fast and they can go disastrously wrong. So calculate your risk carefully. Farmers dealing may not have a choice about their journey, but many of the rest of us do. And farmers have alternatives to cars. Two of the most important things to check for winter driving conditions are your battery and your tyres. If your battery is old and or failing then you are likely to have major problems. If your battery fails then so to do your heating, lights and everything else and the car won't start. If your battery is older than three years then you really should have it checked and see if it needs to be replaced - batteries work hard at all times of the year and are not designed to last forever. Having a good battery is half the preparation for winter driving. Tyres are a vital consideration. Your tyres are the only thing between you and the road and they are what stops you when you need to stop. The minimum tread depth for tyres in Ireland is 1.6 mm - anything lower is asking for trouble. The Road Safety Authority (RSA.ie) provides a very handy credit card-sized device that allows you to check the depth but you can just pop into a good tyre shop and have the check done. Driving on worn tyres may well be the most dangerous and expensive mistake you can make. Also, check whether your car carries a spare wheel ? Is it inflated ? Do you know how to change a wheel ? If your car does not have a spare wheel then do you know how to use an inflation kit. It surprises me how many people discover their car does not have a spare wheel only when they end up with a puncture on the side of the road or the motorway. You should also understand some principles of driving through floods and on ice or snow. Never drive into water directly behind another car (the Principle of Archimedes proves that the water displaced by the car in front will wash back on your car) and never drive through it unless you can see the way out ahead. Drive in the middle of the road as its usually the highest point. Be very prepared for sudden and unexpected lack of visibility and slow down. When driving on ice or snow use as high a gear as you can to maintain traction; don't brake suddenly but do do gradually and keep your right foot light on the accelerator. If you do skid then drive into the direction of the skid. If you jerk the wheel in the opposite direction then you will have no control. Also remember never to leave your engine running and the car unoccupied when you are de-icing the car. Gardai have reported at least two cars being stolen recently as their owners went inside to wait for the car to clear itself of ice. Never use boiling water to de-ice - there's a very good chance of cracking the windscreen, so just use warm water. Don't pour water on or into the door locks as residual water can lodge and then freeze the locks even more later. It's also important to know whether your car is driven through the front wheels or the rear wheels as this is where the power and grip go. Most cars in Ireland are front wheel drive but many German-made cars, such as Mercedes and BMW are rear wheel drive. If you accelerate the power is going to go through either set of wheels, so be mindful of where exactly the spinning is likely to occur. Rear wheel drive cars can fishtail easily when there is more power than traction. Many newer cars these days are also fitted with technology such as traction control, which will transfer power to a spinning wheel. However, this is not a fail-safe method of keeping traction. 1. Check your tyres…they are your only contact with the road. Tyres should be at least the minimum legal thread depth of 1.6mm but need to be changed before they get this worn. Tyres need to be to the correct tyre pressure to give the motorist the best chance in extreme conditions. 2. Use your lights. As we come into the winter months, motorists are advised to use dipped head lights during the day so you are easily seen. Headlights and taillights should be in working order. 3. Understand your brakes. Check your car manual and find out if your vehicle has safety assist technology such as Electronic Stability Control (ESC) or Anti-Lock Braking System (ABS). 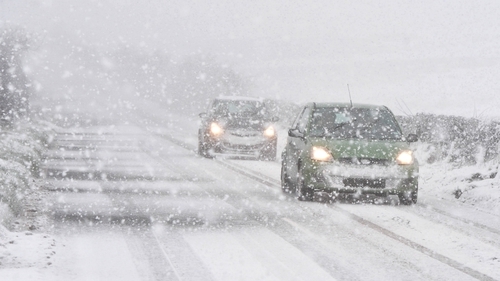 Learn how these technologies can assist your driving in harsh weather conditions. 4. Safe Distance. It takes longer to stop a car during the winter weather so slow down and allow extra distance between you and the car in front. 5. Make sure you can clearly see. All too often motorists do not de-fog or de-ice windows and mirrors which can compromise visibility. This winter ensure windows and mirrors are clear, and carry a de-icer and screen scraper. Do not use boiling water as this can crack the windscreen. 6. Beware of "Black Ice". Black Ice is one of winter’s biggest hazards as it is difficult to see. Watch out for sheltered/ shaded areas on roads, under trees and near high walls. 7. Be prepared. During these winter months it is advised that motorists carry a number of essentials in the boot of their car, including a high visibility vest, spare fuel, appropriate footwear in case you need to leave your vehicle e.g. boots, a hazard warning triangle, a spare wheel (Check that your spare wheel is in good condition and is fully inflated. Some cars may have an inflation repair kit instead of a spare wheel. Make sure that you know how to use it, tow rope, shovel, de-icing equipment (for glass and door locks) , spare bulbs, first aid kit,fire extinguisher, a working torch, a car blanket, additional clothing and some food and water. 8.In the event of a breakdown, drivers need to ensure their vehicle is well in off the road so as not to obstruct other vehicles. The driver should also put on their hazard warning lights. If the vehicle breaks down on the motorway pull in as far as you can, alerting traffic behind you with hazard lights. The driver should leave their vehicle, get behind the barrier (on the embankment) and call the Gardaí, on their mobile phone or roadside telephone. 9. Keep up to date. Listen to local weather and traffic reports. Pay heed to the weather warnings alerting drivers of unsafe and dangerous driving conditions. See our video below from Richard Tuthill of Below Zero Ice Driving. He's an expert on Artic driving and has some great tips on driving on ice or snow on ordinary roads. Carry some basics in the car. Think about putting some warm clothing in the boot (this is really important if you drive with children in the car), along with a high viz jacket, a torch and some basic foodstuffs, like nuts that won't perish. And make sure your 'phone is charged - if it's not, a dodgy car battery will put the kibosh on your plight entirely. So, back to the old advice being the best. In any extreme weather situation watch your speed very carefully, slow down when visibility is restricted (as it can be even on a sunny day when the winter sun is low in the sky) and don't take chances. Here is an AA guide to being prepared for winter. Watch Richard Tuthill's advice for non-specialist drivers travelling on snow or ice.